This CEU program consists of 2 streaming videos. Some of the information in this program (SMD1 and SMD2) is included in the longer seminar SEM22C2. Applicable to the birth to three population. Presented by Maria Huben, P.T. This video discusses and presents examples of the process of normal sensorimotor development in supine, prone, sitting, and standing. Developmental movement and postural components that establish skill and lead to increasing skill development are clearly presented. Presented by Maria Huben, P.T. 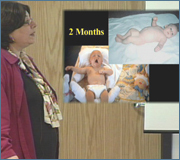 This video presents and contrasts normal and atypical sensorimotor development in supine, prone, sitting, and standing. Developmental movement and postural components that impair the establishment of skill in children with neuromotor disorders are clearly presented. 1. Describe the essential developmental components in supine. 2. 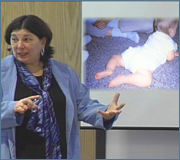 Describe the essential developmental components in prone. 3. Describe the essential developmental components in sitting. 4. Describe the essential developmental components in standing and walking. 5. Describe atypical developmental components in supine. 6. Describe atypical developmental components in prone. 7. 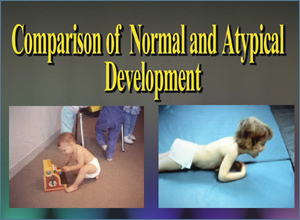 Describe atypical developmental components in sitting. 8. 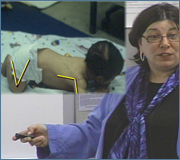 Describe atypical developmental components in standing and walking.